Be ware of any possible lawsuits if people are injured when entering a home. 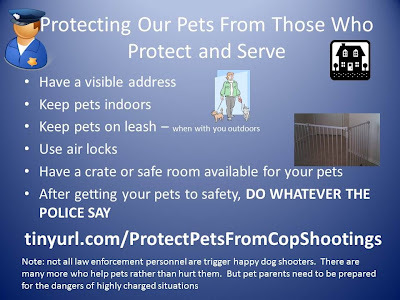 For dogs who are left outdoors or for dogs who are outside with their pet parents - just like indoor air locks, this provides an extra barrier to hopefully make law enforcement feel safe enough to not shoot. I suggest a lock on the inside of the outside gate and a carabiner clip on the inside gate - to further slow down entry and to give pet parents time to get their pets to safety. Keep your pets away from the police. Some people aren't adept at reading body language - especially during a highly charged situation. Don't assume your dog is not at risk just because he or she is friendly. So if the cops knock on the door, inform them that you are putting your dog away - before you open the door. Always keep pets on leash when they are not secure in your yard or in your house. It doesn't matter if you have the best trained dog. Some cops might be intimidated by an off leash dog - even if the dog isn't moving. And if you are breaking leash laws, you might have a difficult time defending your dog in a court case. We want our dogs to feel okay about strangers, but there is no need make our dogs approach strangers. We can give our dogs treats for simply looking at people from a distance. If dogs get in the habit of approaching every person that they see, they might approach people who shouldn't be approached - like a police person in the line of duty. You don't need to sleep in work clothes. A T-shirt and comfortable shorts will do. You might need to act quickly (to get your pet to safety). Tossing on a robe or wrapping yourself in sheets (to hide your naked body) can waste precious seconds. So you can move about the residence quickly without running into something. If your dog doesn't normally sleep in a crate or safe room, you should still have a way to easily and quickly get your pet to safety. On your fence and windows. So hopefully, your dogs won't surprise the cops. For those who might be worried about law suits, a "Dog On Premises" sign is probably safer than a "Beware of Dog" sign. But pet parents who still have concerns, could post a "Fire Fighters, Please Save Our Pets" sign. Actually everyone should have one of those anyway. It will let people know there are pets on the premises but it doesn't tell anyone that you know you are harboring a dangerous animal. Pet guardians who are concerned about legalities should consult with an qualified attorney. Of course we can train our dogs to come back to us when called, to not run up to humans, to stay by our side, to leave-it, etc.. This is not a time to determine who is right and who is wrong. The only thing that matters is your pet's safety. Even if the cops are extremely rude and overly forceful.. even if they are at the wrong house.. just follow their orders completely without talking back. You can always file a complaint or civil suit later. Actually, put your pets away first (and inform them that is what you are doing), then follow their orders. Help teach the public how to respond to police and how to keep their pets safe. Volunteer to talk at schools, community events, etc.. Most police are not trigger happy dog shooters. (See some examples here). But pet parents should be prepared for the dangers of highly charged situations. Hopefully, police departments are/will educate police officers in approaching, dealing with dogs, etc. Meanwhile, I'm looking for a yorkie-sized doggy bullet-proof vest - sad that it's come to this. Thanks Squeezer. Well I looked around on the internet and found bullet proof vests for German Shepherd sized dogs. I bet one of the companies would make a special small one for you.